Refined, yet comfortable, remodeled ground level condo with granite countertops, new appliances, natural stone wood fireplace, recessed lighting and designer bear motif log furniture. Beautiful mountain views, two trout ponds and a creek surround this home. Additional windows in the dining room and bedroom make this end-unit brighter and sunnier than other rental units. Sleeping arrangements are a king bed in the bedroom, children's bunk beds and a queen sofa bed. Other amenities include two flat screen HD TVs (60' & 52'), Blu ray and DVD players, breakfast bar, nearby jacuzzi/sauna and shuttle bus service for skiing/snowboarding or in-town sight seeing. Athletic center and two golf courses are available for additional fees. Our location is well known for its natural beauty which includes the John Muir Trail, Ansel Adams Wilderness, Devil's Postpile National Monument, Yosemite National Park, Mount Whitney and Mono Lake. This is a non-smoking, no pets unit. A 50% deposit is required with reservation, balance due no later than 45 days prior to arrival, $300 refundable security deposit, $95 cleaning fee. Great unit. Great location. Great experience! 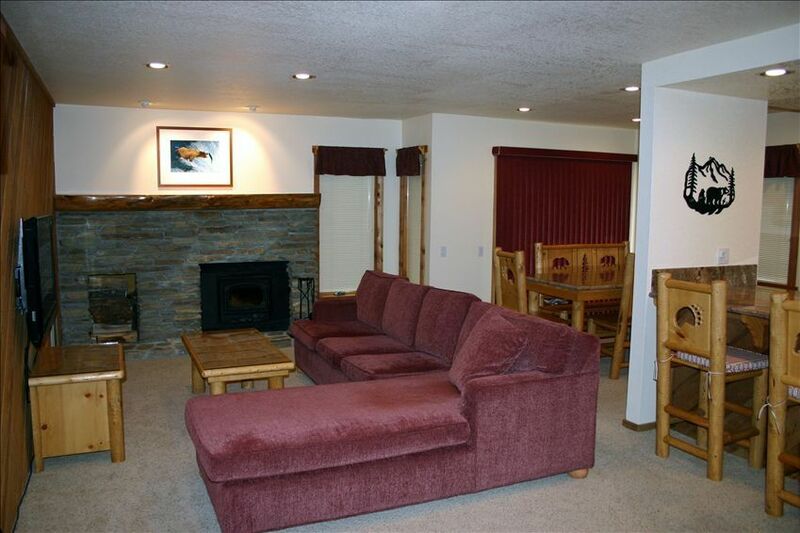 This unit offered my family and I a great stay while visiting Mammoth Lakes. It was very clean and organized, had everything we needed, the wifi was fast and easy to connect to. There was plenty of space for the four of us to spread out and be comfortable. We look forward to staying there again in the future. Thank you!! This condo is small and cozy. It's fairly well situated, a short drive to everything. It isn't particularly homely, just the bare essentials. No board games or books/magazines in there. The walls and ceilings are very thin so if there are people staying in the condo above you will hear them walking around. Loved the property, and facilities! The only drawback was they didn't supply firewood. That was a first. This home was very comfortable and a welcoming retreat after a long day on the slopes. The home was clean and neat and the proximity to parking was excellent. Communications with the owner was also excellent. Home was clearly marked with instructions so adapting to new surrounds was very easy! From heating to television we had zero questions about using the home. They even have bunk beds for the little ones which was a fun addition to the unit. The only issue I found was that the master bed was way too soft which is unfortunately an issue for me but will be an added benefit for someone who loves soft beds. 4.5 out of 5! Wish I could do half stars in the rating above. Thank you for your hospitality!! The condo was very clean, comfortable and met all our needs. The location was ideal and we got to take some wonderful walks along the creek. We could not have asked for more in this condo. Everything was absolutely perfect!! It exceeded every expectation we had!! We will be booking this place again next time we come. Thank you Sarah for hosting us.